#AskGaryVee is a condensed version of Gary Vaynerchuk’s Youtube show #AskGaryVee. It lays out his philosophy and beliefs through a string of questions and answers. A major tenet of Gary, in all his communication, is the need to hustling (ie. : working hard). Gary proposes to remove some time from television and investing it in anything else that moves you closer towards your goals. Are you working as hard as you could? Read Crush It and Jab, Jab, Jab Right Hook for more. Gary seems to be in the realistic camp. Like Ray Dalio he stresses the importance of staying grounded on reality. He says it’s important, especially for people in a position of power, to have people around telling you what you’re doing well or wrong. If you don’t, you’re likely to build your own reality, which might not work well. Gary also recommends you ask the people around for feedback on what you’re good at. Peter Diamandis in Bold call your big goals “moonshots”. Don’t worry if your goal doesn’t sound worthy, your goal is to motivate you, not to make you look good or cool. Gary for example wants to own the New York Jets, which to me sounds silly. But it doesn’t have to sound good to me, that’s what motivates Gary to keep going. Indeed it’s not what a goal is, it’s what a goal does (to you). When you have a big north star lighting your path, you will worry less about the pebbles on the way. A big goal not only will keep you focused on what mattes, but it will also increase your grit and resilience, which are key to success (also read Grit by Angela Duckworth). Another great takeaway from #AskGaryVee for me was to learn to love everything you’re doing. Gary says he loves the calls with angry customers, the HR headaches and the daily grind. Tying it back to his big goal, he says that it’s easy to love it all when you know everything is inching you closer to your big goal. The next use of self awareness is knowing your strengths. Gary espouses an idea common today in self development circles, which is to work on your strengths. Your weaknesses should receive your attention only as long as they are holding you back. Otherwise, focus on what you’re good at: that’s where the biggest bang for the buck comes from. Clouds are your overarching vision and values. Dirt is the tactical, day to day grind to execute on that vision. I really liked the idea of loving it all, struggles included. When you can reach a place where you really love what you’re doing, including the difficulties, you’re golden. Analyze what you’re good at and what you’re passionate about. That’s probably what you should put your efforts into. Could have been a bit shorter. I believe that to give good answers, one should also draw from the data. Gary’s answers are more based on his views and opinions, which tend to be rather black and white. 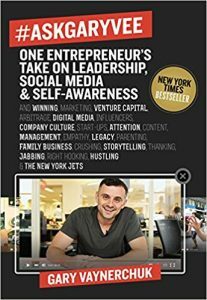 As of 2018, #AskGaryVee is possibly my favorite Gary’s book (and it’s likely to stay that way because I’m not planning to read any more from Vaynerchuk). Watching the show to get Gary’s philosophy can be long and time-consuming. With #AskGaryVee you get all his wisdom in a condensed form (and you can skip the show if you don’t have time).